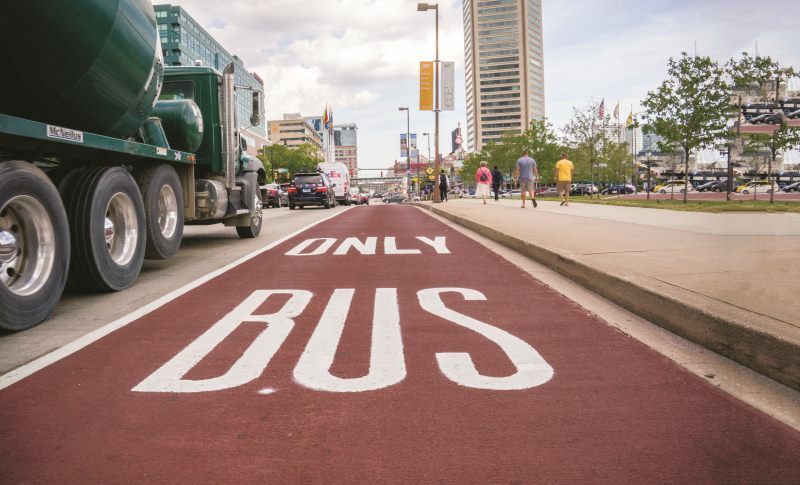 BaltimoreLink included the planning, design, and installation of dedicated bus lanes to provide efficient bus movement through downtown Baltimore. These enhance and complement the existing dedicated bus lanes on Pratt and Lombard Streets. 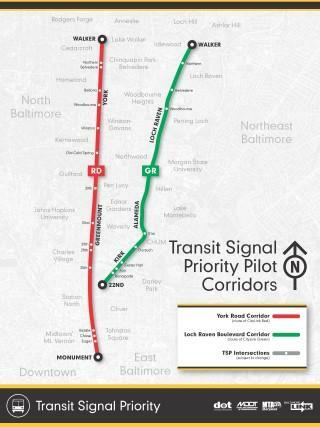 In total, BaltimoreLink included implementation of a 5.5 mile network of dedicated lanes on high volume corridors. Dedicated bus lanes minimize delays associated with auto traffic, particularly during rush hours. These lanes offer speed, safety, improved reliability, and improved on-time performance for transit vehicles. Planning and design for dedicated lanes is being done as a partnership between MDOT MTA and the Baltimore City Department of Transportation. 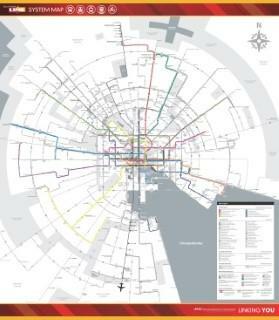 Detailed maps for dedicated bus lanes can be found in the BaltimoreLink document library. 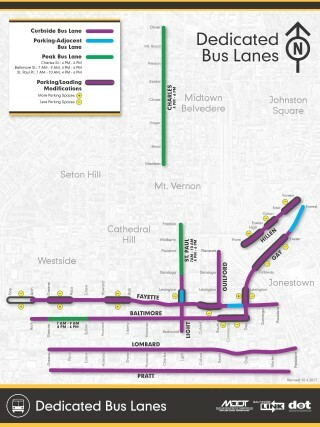 In February 2019, MDOT MTA released a Before and After study on the effectiveness of these dedicated bus lanes. Improvements in travel times were found for 79% of the bus lanes during peak periods. 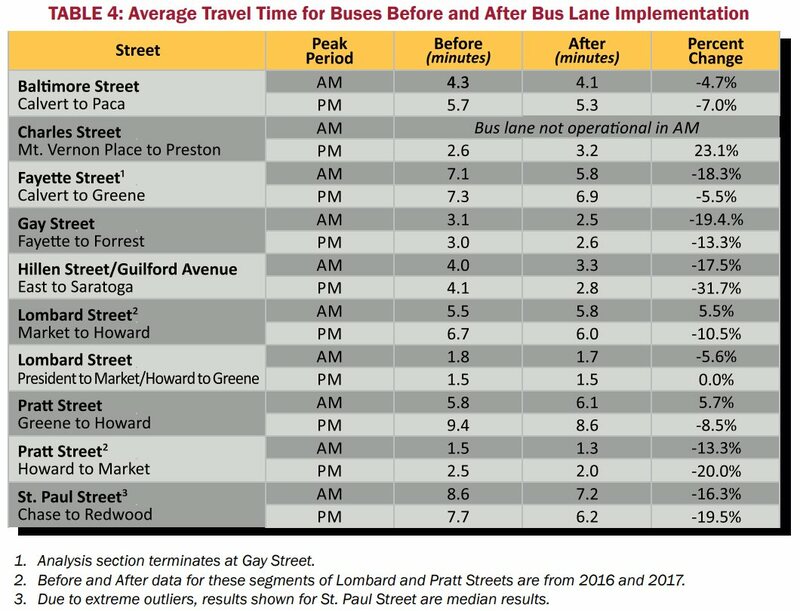 Travel time savings ranged from 4.7% on Baltimore Street, to 31.7% on Hillen Street/Guilford Avenue, with an average benefit of 9.3% per corridor. In addition, the data indicates that the bus lanes have also improved safety by reducing the number of bus-involved crashes by nearly 12%. These dedicated bus lanes have not had a noticeable effect on general traffic flow with additional travel time taking less than a minute. The full Before and After study for February 2019 can be found here. Transit Signal Priority (TSP) has been implemented at key intersections along York Road and Loch Raven Boulevard. TSP reduces wait time at traffic signals for transit vehicles by holding green lights longer or shortening red lights to expedite travel through intersections. 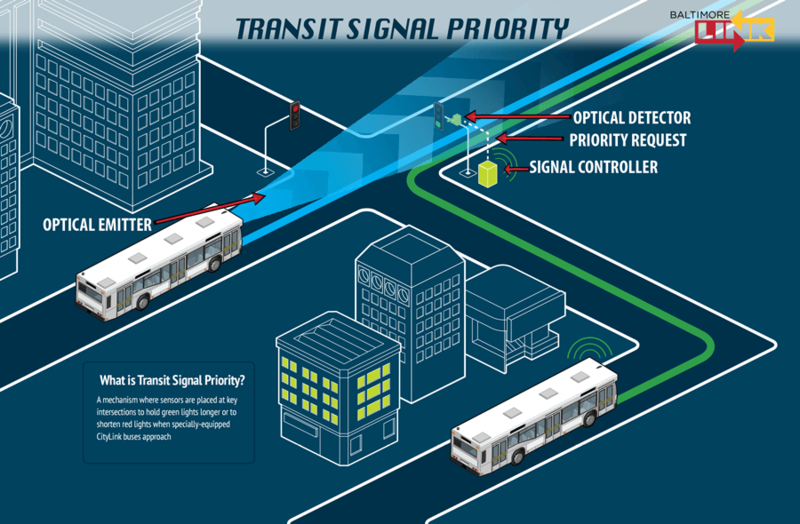 This technology will aid in reducing travel times and improves the overall reliability of the entire bus system. Additionally, audible and visual safety alerts have been installed at downtown intersections along Howard Street to alert patrons when a train is approaching. MDOT MTA is improving the transfer experience for riders across the system by adding amenities such as Real-Time Information Signs, new bus shelters, improved lighting, more informative bus stop signs, improvements to pedestrian safety, on-street ticket vending machines, bike racks, improved safety, and much more. While improvements vary depending on location, the West Baltimore transfer facility is an example where all of these elements are at one place. 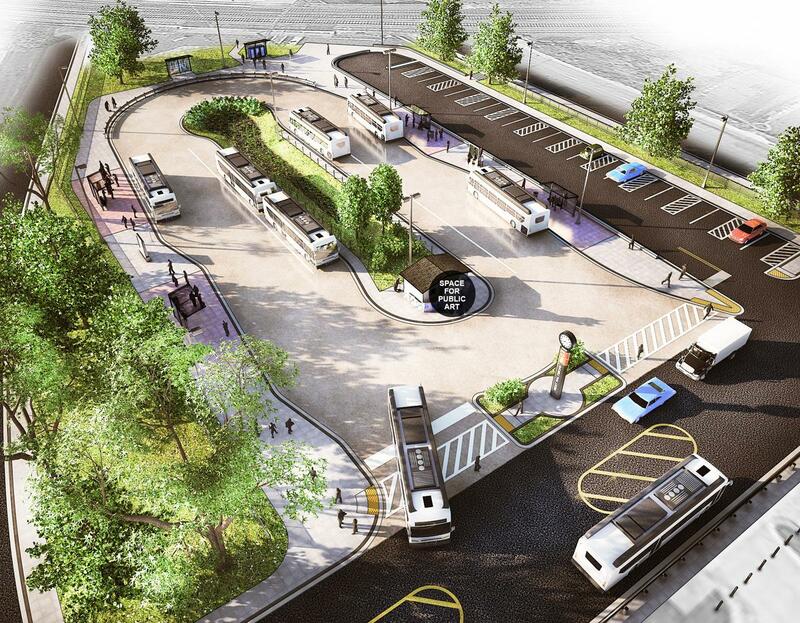 The West Baltimore transfer facility includes amenities such as shelters, real-time information signs, ticket vending machines, bike racks, CCTV cameras and blue-light phones, carshare access, improved pedestrian crossings, improved lighting, and a custom art installation. Providing access to much of the region while making the transfer experience as safe and convenient as possible, the West Baltimore transfer facility is a great addition to the system. In an effort to create a better rider experience by providing information you can use, MDOT MTA installed new bus stop signs and distributed new maps. 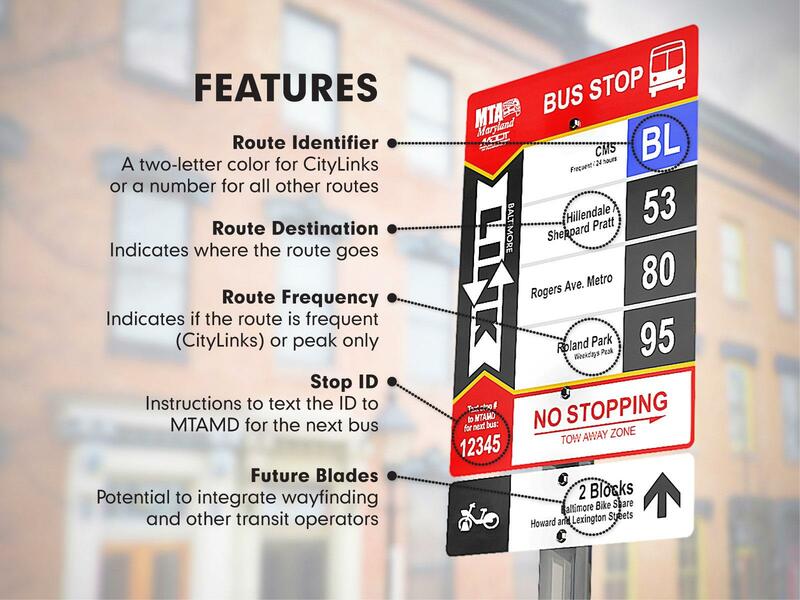 The goal of new signage is to communicate better information, such as route destinations and frequency, in a clear, easy-to-use fashion at all MDOT MTA bus stops. Bus vehicles have been wrapped in BaltimoreLink colors that are consistent with our bus stop signs and maps, and all of these elements create a unified and easily-identifiable transit system. MDOT MTA is introducing new, on-demand, and shared use mobility choices to encourage transit use, facilitate first and last mile connections, reduce transportation costs, and improve overall efficiency of Maryland's collective transportation system. Strengthening partnerships with local authorities and leveraging private-sector innovations means more and better options for people to complete their daily trips safely, reliably, and efficiently. Car sharing provides affordable, on-demand access to cars. 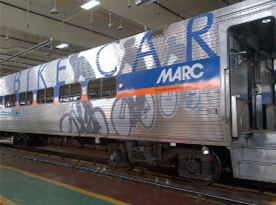 MTA will be adding car sharing to MARC Train, Light RailLink, and Metro SubwayLink parking facilities, allowing transit riders to make the first or last mile (or several miles) of their trip without needing to own a personal vehicle. MTA is supporting better connections between local transit operators and the BaltimoreLink network. Increased funding for the Charm City Circulator will support improved connections to the new CityLink routes. Additional funding and collaboration with the Regional Transit Authority (RTA) will result in the development and implementation of a Fort Meade Shuttle, providing better connections between MARC Train stations and a major employment center.